My first reaction to this Delsey UnderSeat Tote was “Oooo I want this!”. This piece is really a woman’s dream tote. I love how the tote is organized with lots of pockets and compartments. There is a space for everything, so all my carry-on essentials don’t get jumbled together in one big pocket. The smooth rolling wheels really save your back, and make it easy to maneuver. It’s just the right size to slide under your seat or slip into an overhead compartment. It’s even great as a purse for a day trip. So, yeah, I pretty much love this tote. Check out my review on the Delsey UnderSeat Tote to find out the many reasons why. For you guys looking for “underseat” style luggage, read our review of the Samsonite Underseater Carry-On. The Delsey UnderSeat Tote Luggage is made of a soft fabric polyester blend. 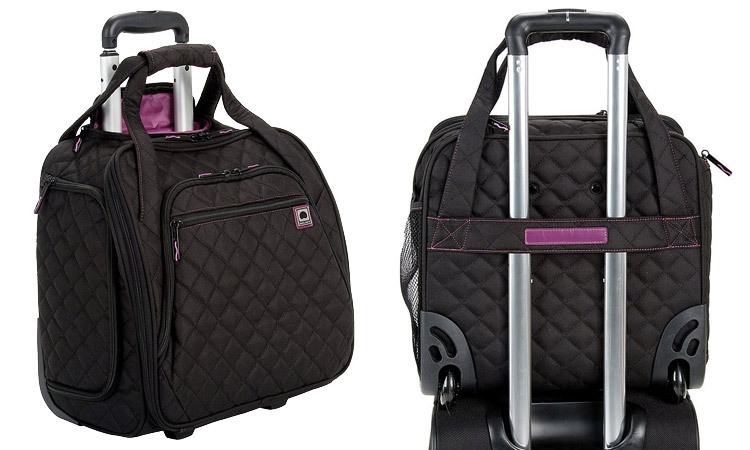 The diamond shaped quilted pattern gives the tote a nice textured look and feel. The fabric seems to hold up quite well and wipes easily. The outside has plenty of pockets to help organize your travel essentials just the way you want it. There is a side zip pocket with a mesh elastic pocket inside, perfect for keeping something you don’t want exposed, but want to get to quickly (like lip gloss or deodorant). On the other side is an exposed elastic mesh pocket, just right for a water bottle or umbrella. Or both. 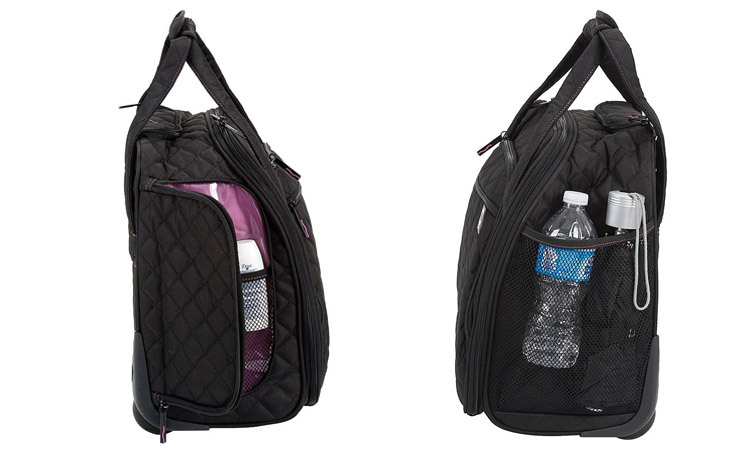 It has an easily accessible front pocket that’s perfect for storing a your passport, tickets, and of course snacks. It’s much easier to stay organized with this tote. There is a sturdy retractable top handle accompanied by a dual set of extra top handles. I also love the back strap for securing this bag on top of a another piece of luggage. The strap slips right on to the handle. For easy maneuvering, the free moving wheels ensure smooth travel. 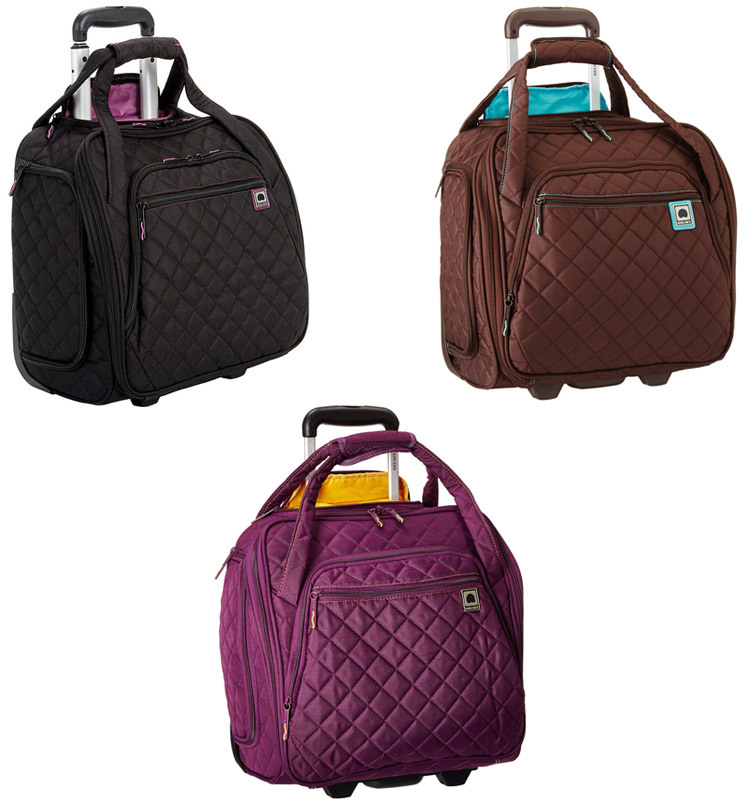 The Delsey Quilted Rolling UnderSeat Tote comes in 3 colors: black with pink lining, brown with turquoise lining or purple with yellow lining. The black and pink is a safe choice with a pop of color inside. Of course black pretty much goes with everything, so you can’t go wrong there. The purple is more of a plum color, which is stylish and unique. Not sure about the yellow lining, but it is a nice contrasting color. 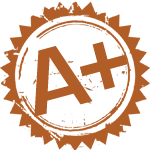 I really like the brown because is a soft chocolate brown, with a lovely turquoise blue lining. Also brown tends to hide lint better than black. The number of pockets this Delsey luggage has is insane! In a good way. For such a small piece of luggage, the space inside the tote is amazing. It’s like the Tardis (Doctor Who fans know). The main compartment has enough pockets for everything you can think of. And the foam padded pockets provide protection for more fragile valuables. With so much room, the Delsey tote really could be used for a weekend getaway. You can pack in extra clothes and even a additional pair of shoes. In addition to the larger pockets there are several smaller pockets that would be great for electronics and toiletries. I really love this for business travel because you can wear some comfy “commuter” clothes and shoes on the plane and then glam up in a jiffy with a fresh outfit and pair of heels. The interior is also attractive with colors that pop but are still classy and professional. What makes this tote the perfect “underseat” piece of luggage is the main front compartment, as shown in the first picture. So even while the bag is stowed under the seat on a flight you can easily pull out your tablet, phone, etc. In fact, even while waiting in the airport it’s great because you don’t have to lay your luggage down and open it up to access these items. I know I want a travel tote I can count on. A tote that is stylish, but durable enough to withstand my frequent travels. At first glance this bag may look a bit fragile. I was worried the soft fabric may rip or tear. However, according to my research and consumer reviews this is actually one of the most durable travel totes on the market. The exterior is made from very high quality durable polyester that is designed to handle regular travel. It can also be easily spot cleaned without wearing out. This tote is extremely well-made and durable. It definitely lives up to the reputation of Delsey for style and quality design. At around $80 and up (depending on the sale) it’s definitely not the cheapest tote on the market. However, with this Delsey Underseat Tote you are getting more than your money’s worth because of the excellent design (pockets everywhere!) and high quality. Instead of getting a bag that will fall apart within a year or two, I recommend spending a few extra bucks and get something that will last. User reviews on various websites average around 4.4 stars out of 5. The general consumer consensus looks quite good! No real issues with quality or design. This tote is a perfect complement for any trip. It’s really made for a woman with it’s color options and design, along with many pockets for all those little things us girls carry. The design is functional and easier on your body than a back carried tote. It’s the perfect size to slip in an overhead compartment or to slide under your seat right at your feet for easy access. 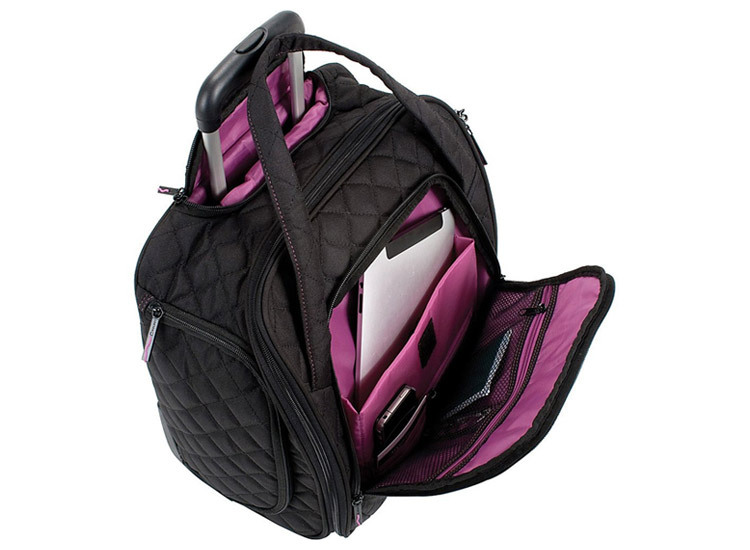 Perfect for traveling in style while staying organized even on long trips. I love this bag and have also considered getting one as gift for a friend or family member! You can pick up the Delsey UnderSeat Tote on Amazon. Want a hardcase carry-on? I recommend the Delsey Chatelet Carry-On.